Can he play for the Falcons? Does he qualify? According to the rules an international cup player, must have lived the majority of his life between the age of 10-16 in that country. If he didn't move there untill 2001, he can't qualify (he was 15 at the time). Interesting question - I've heard a few things which I can't really post here as I don't know if they're for real or just rumours. So I don't know, he might end up playing for them. I'll try to get a comment from the NZAFL on whether they think he is eligible. They'd have the rules and his details presumably. 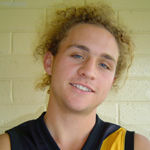 The NZAFL have advised that they do believe Blyth is eligible to play for them in the 2005 IC. Please note that the links to Quenabeyan and the AFL Canberra have been fixed.